Palladium, referred to by some as platinum’s cousin, is known by many for its use in catalytic converters, as well as for medical and electronic applications. Shining radiant white, the metal is mined in North America, South Africa and Russia. Palladium bars are privately minted, meaning they are not produced by government mints. They come in a variety of sizes and weight, such as one ounce, 10 ounces and one kilogram, and often bear artistic designs. Palladium rounds are also privately minted and are most commonly sold in a size of one ounce. Any palladium bars or rounds that contain a fineness of at least 0.9995 are eligible for placement in a Precious Metals IRA. 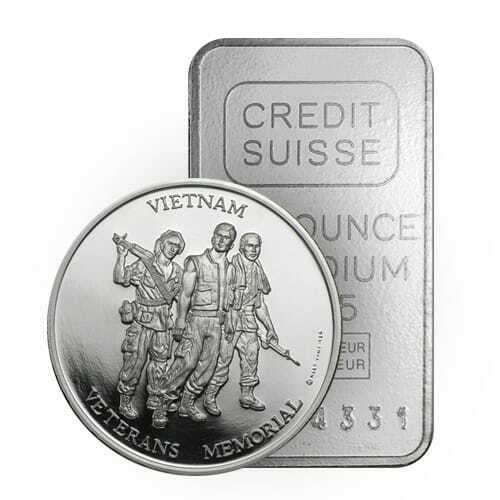 To learn more about palladium bars and rounds please call us at (800)355-2116.